The holy city of Chidambaram, known as the 'city of the Cosmic Dancer' is located 245 Kms away from Chennai. The ancient Nataraja temple of Chidambaram pays special tribute to Lord Nataraja- the dancing Shiva. The magnificent gold roofed temple situated in the middle of the town has a bronze image of Nataraja in a dancing pose known throughout the world as the most perfect synthesis in metal art. The temple has carved pillars depicting Lord Nataraja in 108 poses of Bharathanatyam classical dance in the eastern tower. The Natyanjali festival dedicated to Lord Shiva is celebrated every year during February-March for five days in the temple premises. This is an opportunity for all dancers, from all over India, to perform and to pay their tribute to Lord Nataraja. It begins on the auspicious occasion of Maha Shivaratri. During this time leading dancers from all parts of India congregate and dance in the temple as an offering to Nataraja. 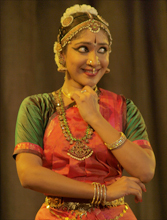 Many dancers think it is a blessing to be able to perform their 'arangettam' (first stage performance) in the vicinity of the sanctum sanctorum of Lord Nataraja in Chidambaram. The festival lasts for 5 days. Natyanjali festival is jointly organised by The Department of Tourism, Government of Tamil Nadu, The Ministry Of Tourism, Government of India and The Natyanjali Trust, Chidambaram. It is designed to promote a universal message of 'Unity in Diversity' conveyed in the universal language of music and dance. Now Natyanjali festival is held annually in other temples in places like Thanjavur (Sri Brihadeswarar temple), Thiruvarur, Thirunallur, Kumbakonam (Sri Adhikumbeshwarar temple) Nagapattinam, Tiruchi, Mylapore (Sri Kapaleeswarar Temple) etc. This festival popular as Brihanatyanjali is held in Thanjavur Brihadeswarar temple with the huge Nandi image as the backdrop. Air: The nearest airport is at Trichy, at a distance of 160-km. Rail: The railway station is close to the Nataraja Temple. Express and passenger trains leave for Chennai four times daily, Kumbakonam, Thanjavur twice daily, Tiruchirappalli and Madurai. Road: Chidambaram is well connected by road with Chennai, Pondicherry, Madurai, Thanjavur, etc.